The Ultimate Employee Benefit? A Strong Work-Life Balance. - JPS, Inc. When employees feel a sense of control and ownership of their lives they are often better able to leave work issues at work and home issues at home. That balance leads to increased motivation and reduced stress, which in turn increases productivity and reduces conflict between coworkers and management. One of the most positive ways to reduce stress is exercise. Employees who eat healthy and exercise face lowered risk of getting sick and missing work. If your office building has a gym facility on-site, encourage them to take advantage. Otherwise, consider offering a discounted membership to a local gym as an employee benefit. You can also encourage your employees to exercise by holding a friendly weight-loss competition, or sponsoring a fun run. For parents, childcare is an expensive and stressful necessity that can throw of an entire day if there are unexpected changes. Offering an onsite childcare facility is a highly desirable employee benefit, but if that’s not feasible consider offering a small stipend to alleviate the cost. If neither of those options are possible, try to allow your employees some flexibility to care for their children. That can include the ability to take time off to care for a sick child, adjust their lunch break to attend special events, or a flexible start/end time for parents who drop their children off at school or pick them up in the afternoon. One of the best ways to boost employee morale and encourage workers to form friendships with each other is by offering the occasional company outing. This can be as low-key or extravagant as you want, depending on your budget. For example, an employee benefit of catered lunch or occasional happy hour at a favorite group-friendly restaurant nearby. Happy hours, birthday celebrations and outings to local events are other fun ways to get out of the office and bond in a non-traditional setting. In the workplace, it’s important to maintain a sense of consistency and organization in your company structure. Employees will feel less day-to-day anxiety if they know what to expect as often as possible. Everyone has a bad day now and then, so it’s nice to have a designated space for employee benefit where they can go when they just need to step away for a minute. Create a space that’s uncluttered and free of all company materials. Fill it with plants, comfortable seating, reading material, healthy snacks and even some light music. It may sound cheesy, but team-building exercises really can foster a sense of teamwork around the office. If your employees feel like they can depend on each other for support they are more likely to express themselves or seek help when feeling stressed or overwhelmed. Science suggests that vacations are actually great for productivity. However, employees who work at small companies or growing start-ups often feel the most pressure to work every day without regard for personal time or self-rejuvenation. One way to encourage your employees to take vacations for their own benefit is to implement a “use it or lose it” vacation policy to encourage them to get out of the office. On a smaller scale, it’s important to employee’s mental and physical health to get away from their workspaces throughout the day. The human body was not designed to sit and stare at a screen for 8 hours a day, and doing so can lead to a wide number of health issues. A report put out by the Mayo Clinic warns against a heavy imbalance between work and life. When an employee is tired, their ability to work productively and think clearly may become compromised. That can take a toll on their professional reputation, or lead to dangerous and costly mistakes. This is just one negative of many for employers who don’t consider offering an employee benefit or two. Stress and fatigue are also associated with adverse effects on the immune system and can worsen the symptoms from any currently existing medical problems. Stress also puts individuals at risk for developing poor habits like substance abuse. 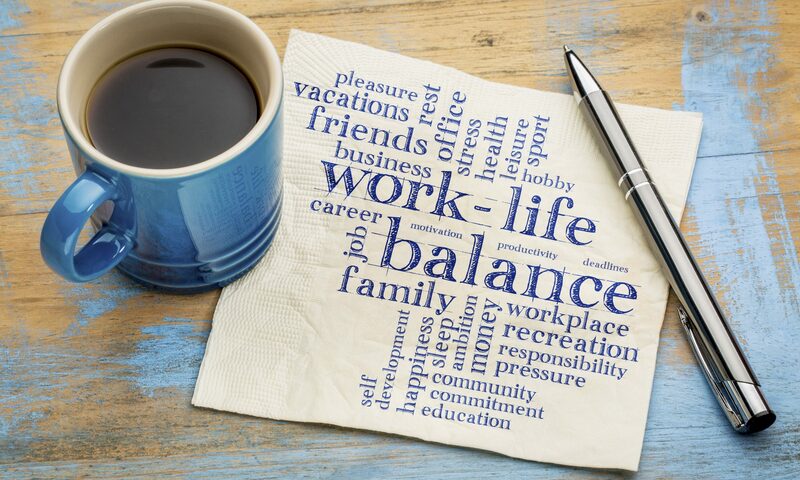 The bottom line is, a good work-life balance leads to happier and more productive employees, and offering at least one employee benefit can be achieved with minimal concessions from employers. Do you find yourself struggling to find that balance? It might be time for a change. Check out our list of currently available positions below to find one that might be just right for you.